Two-time Oscar winner Tom Hanks can now add “two-time utterer of the words, ‘Will you marry me?’” to his CV. And that’s just the times we know about. Hanks is currently on a tour to promote his book, Uncommon Type: Some Stories, a collection of 17 short stories that he wrote on his many beloved old-fashioned typewriters. During a stop in Austin at the Texas Book Festival, according to The Hollywood Reporter, he was approached by a gentleman named Ryan McFarling, who was looking for some assistance in proposing to his girlfriend, Nikki Young. Because he is married, the actor also has some experience with the institution of holy matrimony. And because Tom Hanks loves typewriters, he is intimately acquainted with the feeling of love. Therefore, Hanks was only too pleased to assist. During the Q&A portion of his talk, the man who gave us David S. Pumpkins announced that he was tired of taking questions, and wanted to ask one himself. He proceeded to pull a piece of paper out of his pocket, explaining that Ryan had a question he’d like to ask Nikki: “Nikki, will you marry me?” Hanks read, presumably giving it the same relatable charm he brought to the role of a suspicious man on a staycation in The ‘Burbs. McFarling and Reed then joined the actor onstage, where McFarling got down on one knee and gave Reed a ring. Hanks, sensing he was in the presence of a relationship possessing the same warm emotional honesty as his love for typewriters, gave Reed a hug and offered his congratulations. No further details on the event are offered, but we can only assume Hanks then proceeded to take another couple of attendees out for hot chocolate, before going to the grocery store for a local working mother who ran out of time that day, then capping off the evening by helping a nearby teen write his college application letter. 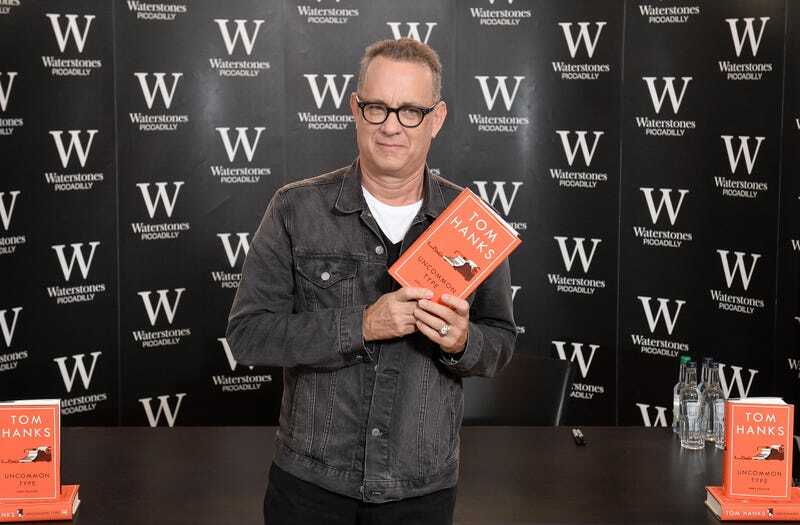 Tom Hanks may be on a book tour, but he’s still Tom Hanks, damn it.